With what has been described as a particularly intense preseason training camp now behind them, the San Diego State coaches have selected the starting offense and defense that will take the field (fires permitting) in the Rose Bowl on Saturday when the Aztecs open their 2009 season against the UCLA Bruins. Among those selected to start was former All-CIF Oceanside High School wide receiver, Jose Perez. 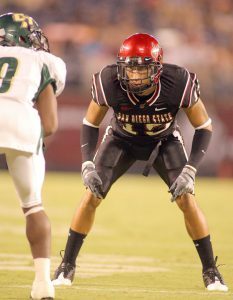 Perez, as he did last year, will be trying to break up passes as a member of the Aztecs’ secondary rather than catch them as a member of their receiving corps. This year however, he will be doing it much more often now that he has earned a starting position. His conversion from dangerous receiver to ball hawking defensive back is now complete and he couldn’t be happier. Figuring that switching to cornerback would both help the team out and get him more playing time Perez embraced the new role. “You have to be confident, quick and tough (to play cornerback).” Perez is all of those. “Playing the corner you are out there on an island,” he said following Tuesday’s practice. He likes the challenge of pitting his skills one on one against the receivers that he faces, but he sees these individual match-ups as a part of something much bigger. He plays down his own very important role. Perez has adopted the team concept that has been preached by new Aztec coach Brady Hoke and his coaching staff from day one. Last year, the injury-plagued Aztecs limped to a 2-10 record. This year, a hopefully healthier team with a completely new coaching staff and many key returnees hopes to be significantly better. This change will likely not happen overnight. It may in fact take several years, but it appears that at least this coaching staff is headed in the right direction. In order to make any significant improvement the Aztecs have to do a better job of retaining more of the stellar high school athletes that this county produces. Perez is one of them and he and others like him could be influential in bringing others in. “I often go back to (Oceanside H.S.) and talk to coach Carroll and some of his players. I have told them about our great facilities our atmosphere and our coaches and tell them how they might be able to get playing time here. I tell them that we have the best facilities on the West coast and that school-wise it is great. Oceanside is usually a power in San Diego. If we could get some of those guys to come here that would be awesome,” Perez said. Planning for the future is one thing, but at the moment the Aztecs face a tough challenge in opening with UCLA. Hopefully, the air quality threatened by the L.A. fires will be acceptable by game time. (Editor’s note: the LA fires have subsided to the point that the air quality is at acceptable levels and the game will go on as scheduled).